As a child of the 80's, I am a Transformers fan. Recently I spoke to a child of the 90's and my six year old nephew, who were also fans. I've met many more guys who are always fans, in fact it seem any male under 30 is a fan of those robots in disguise. 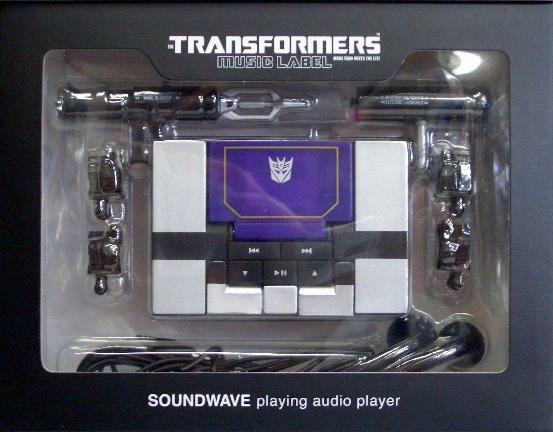 All fans, no matter what age, always wanted one product to be made more - a Soundwave music player. Finally, it is here and it looks awesome. 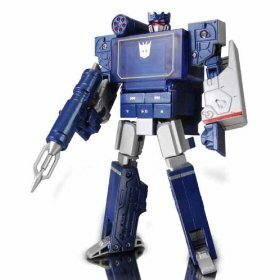 The right-hand 'bot of Megatron, leader of bad guys the Decepticons, Soundwave is one of the most recognised characters from the original Transformers series. His ability to transform into a microcassette deck and use robot cassettes on spying missions, made 80s youngsters everywhere want a real-life Soundwave cassette player. But it never came. No doubt such a player would have proved too pricey and the extra cassette parts would have caused the loss of transformation on such a product. Thankfully the mp3 player keeps the transformation intact and is not bulky in the slightest. Rather then a cassette, this player takes a mini SD card which inserts directly into Soundwave's chest. You can put in mini SD cards with a capacity up to 2gb, allowing for far more tunes then a cassette would ever have given you. It also keeps it light as it weighs in at just over 300g, not as heavy as expected. Also it measures approximately 8.5cm by 6cm, so it can fit into your pocket easily enough. So thankfully it is practical enough to carry around with you and here comes the best bit - the ability to transform has been retained. Fans will be pleased to read that it transforms in exactly the same way as the original 80's toy, so many of you will already know how to transform it! Although the ability to transform it is nothing short of amazing (seriously, show this to any man under 30 and they will turn into a ten year old), I was disappointed at how flimsy it felt once transformed. The pop-up head in particular isn't fixed very well and tends to wobble a bit. Some of it does feel like it could easily be snapped off, so be careful if you let younger relatives play with it. Fans will also be pleased that the player also comes with the original weapons - shoulder gun and blaster - as well as extra hands for these weapons and the pointing 'eject' finger. Sadly the extra hands do not fit into place into place very well, and keep moving around. For display purposes, you would be better off buying the actual Transformer rather then this mp3 player. However this is an mp3 player first and foremost, so is it really worth buying this over an iPod or mp3 Walkman? Well at around £50 this isn't a bad buy for something which can play up to 2gb of music and has the added gimmick of being a fully-transformable Soundwave, even if it is a little flimsy in 'display mode'. When it isn't transformed though it is a reasonable size and weight and works perfectly well as a mp3 player. I found the sound quality to be very good, with it playing songs over 128kbit/s. I also like how the player keeps the original button layout of Soundwave, so there is only five buttons - play/pause, volume up, volume down, track forward and track back - which keeps things simple. There are drawbacks to this layout though, namely that you cannot rewind or fast forward through a track or adjust sound settings. Another annoying feature is that the player resets itself to the first track when you turn if off (you turn it on/off by holding down the play button), so you have to skip ahead to the track you want every time you turn it back on. Some may be put off by the fact that this has no USB ports and instead runs from a single AAA battery. That said the battery life is amazingly good, offering well over ten hours of playback. Overall then this is not a perfect mp3 player nor a perfect Transformer. Once you get over the initial coolness of the product it is sadly underwhelming and you will probably go back to your USB mp3 player or iPod. Since the release of this product the price of mp3 players has dropped, with a 2gb player from the leading brand now costing around £35 and those are the size of a flash drive. With more practical, cheaper and better mp3 players out there, the Soundwave mp3 player is all about the style and not about the content. There is no denying it is a very cool and an excellent product to show off to others, but, talking about the product as a whole, it is only average. As well as the original weapons and extra hands mentioned above, a basic pair of in-ear headphones is also included. Other then that instructions are included on how to transform the mp3 player and a poster of other products available in the Transformers Music Label range (Optimus Prime iPod base and Frenzy & Rumble headphones). The product is packaged in a box with a folding display front.